Dating culture is the latest aspect of human life to be put under the Black Mirror microscope as 'Hang the DJ' takes a thought-provoking look at what it would be like to give up our freedom to choose our partners altogether. How would you act if you couldn’t control your relationships? If you couldn’t choose your partner, stay with someone you like for as long as you like, or break up with a bad partner when you realise it’s going badly? These are the big questions asked in the thought-provoking, surprisingly optimistic and quite frankly superb ‘Hang the DJ’. We’re all well-acquainted with modern online dating, even if we don’t use the apps – Tinder, Bumble, Grindr and the rest have tuned us to swipe, and keep swiping, until we only talk to those we find attractive, and who find us attractive in return. If we don’t like a potential suitor, we can simply stop messaging them, or block them altogether. Sure, awkward dates are definitely still a thing, and online profiles can on occasion prove to be extremely unrepresentative of the person behind them, but swiping has taken a lot of the pain out of dating and hook-ups. The genius of ‘Hang the DJ’ lies in turning this dynamic entirely on its head. Gone are our characters’ choices altogether: who they date, when they start dating, and how long their relationship lasts are all controlled by an app referred only to as “Coach”. Given enough partners, Coach is said to have gathered enough data to find your perfect match 99.8% of the time, and so the people in Coach’s world go along with whoever Coach tells them to meet – the good and the bad. We are introduced to Coach through the awkward Frank (Joe Cole) and the radiant Amy (Georgina Campbell), who are matched with each other through their first use of the app and given 12 hours to enjoy a relationship before being broken apart and given new dates by the system. Black Mirror always comes with an underlying sense of dread, and ‘Hang the DJ’ is no different. Although such a system may seem ideal at first glance (“Imagine how difficult it must have been before the system, having to go out and find people,” muses Frank at one point), the horror of the system soon becomes apparent as Frank and Amy are given year-long relationships with people they can’t stand, alongside fleeting encounters with people they are denied the time to really get to know. And that’s what makes this episode so engaging – you can’t help but ask yourself how you’d act if given an expiration date on your relationships. Would you let yourself fall in love with someone you knew you’d have to say goodbye to in one year? It’s rare to become attached to a one-night-stand, but what kind of attention would you give a one-week-stand? And would all this be worth it to discover – with a not-quite perfect chance – “the one”, given that none of your matches before your “matching day” would be the one? These questions are carried perfectly by the performances of Cole and Campbell, whose chemistry for each other is tangible and who convey their characters’ vulnerabilities superbly. Frank and Amy are both insecure, even if they wear it differently (with Frank resorting to self-deprecating comedy, and Amy presenting a confident facade), but they stand out as they are both every day people. You can relate to Frank, and you can relate to Amy, which makes the tribulations they go through en route to their “matching day” all the more disturbing, and thought-provoking for it; one sequence in particular has us screaming at Frank not to do the wrong thing, and yet desperately relating to his desire to do that very thing. 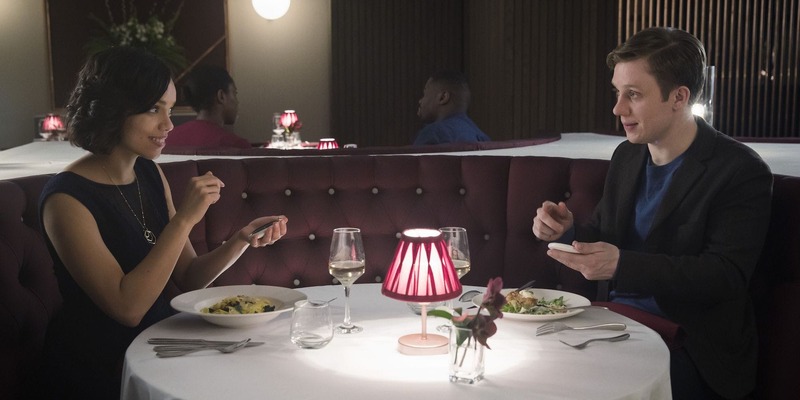 At it’s best, Black Mirror is not specifically about technology, but rather about exposing the flaws and virtues of human behaviour by using technology as a plot device. ‘Hang the DJ’ is Black Mirror at its best: as its plot unfurls, you realise that the true terror of the episode is also strangely optimistic, in revealing how people (or at least some people) will put themselves through almost anything in their quest to find a love for life, even if that “anything” is submitting completely and utterly to an app that tells us who we can and can’t love, a point reinforced by the perfectly worked (if not completely surprising) twist ending. ‘Hang the DJ’ may not be Black Mirror‘s most horrific episode, but by hell is it it’s most thought-provoking. All 4 seasons of Black Mirror are available now on Netflix.